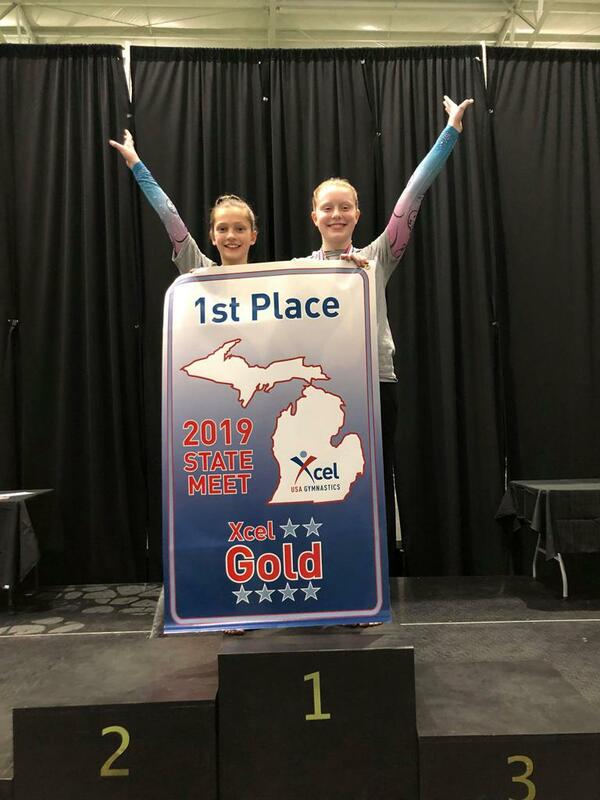 The Rising Starz Gymnastics Xcel Gold Team won its fourth consecutive State Championship the weekend of March 29-31 in Pontiac, MI with an impressive 115.775 score (the 13th highest team score in the country this season and highest in Michigan). The Xcel Silver team also showed up big with a 114.750, which tied them for 2nd place in the 57-team field (ultimately claiming 3rd after the tie-breaker process). In addition to qualifying 51 gymnasts for the Region 5 Championships May 3-5 in Lexington, KY, both squads also placed several gymnasts on Team Michigan for the event. Team Michigan is the Top 16 All-Around scoring athletes regardless of age group. The Top 8 are the A team and 9-16 are the B team. On the Silver side, Jaylin Hunter and Braelyn Johnson will be representing Michigan Silver A Team, while Ryenn McRell competes on the Michigan Silver B Team. Hunter’s 38.225 was tops among the 532 gymnasts who competed all four events over the weekend which was highlighted with a 9.775 on Bars – also tops over the weekend. Johnson finished 8th overall (38.025 AA), while McRell scored 37.850 All-Around to finish 15th. The Golds were led by Georgia Readwin, whose 38.450 All-Around not only tied for the best Gold score of the weekend, but also ranks 36th nationally this year. Following close behind were Emma Shutich and Leah Koch, who both posted 38.250 All-Around scores to finish 4th and 5th respectively and also earn spots on Michigan Gold A Team at Regionals. Three Gold gymnasts also qualified for the Michigan Gold B Team in Maddy Gallatin (37.975 AA – 10th), Faith Vyn (37.975 AA – 11th) and Ashely Williams (37.875 – 14th). Rising Starz teammates Maiya Corrigan and Maddie Pastoor pose with the team's 4th consecutive Xcel Gold State Championship banner.